For better or for worse, this year's Academy Awards ceremony is going to go without an official host. The last time the Oscars were presented this way was three decades ago, and the show is infamous for being a complete disaster. However, going with no host was clearly not the Academy's plan from the start. We all know about the well-publicized fiasco with Kevin Hart potentially hosting the show, with the comedian ultimately stepping down. Before Hart had been offered the gig, however, the original plan was to go with his Jumanji co-star, Dwayne "The Rock" Johnson. However, Johnson's shooting schedule for the Jumanji sequel wouldn't allow him to host the Oscars, according to the legendary actor himself on Twitter. "I was their first choice to host this year, and my goal was to make it the most fun and entertaining Oscars ever. We all tried hard, but couldn't make it work since I'm shooting Jumanji. Academy and I were super bummed but maybe one day down the road." Needless to say, finding a host for the Academy Awards has been rather difficult this year. Following missing out on getting Dwayne Johnson, Hart may have seemed like a logical go-to name for their next choice, as one of today's most well-known comedians. After his hiring was announced, however, homophobic jokes unearthed from Hart's Twitter account threw a wrench in those plans. The controversy ultimately resulted in Hart stepping down from the gig, sending the Academy back to the drawing board. Many names were rumored to serve as Hart's replacement, with the final decision being that the show will rotate several A-list Hollywood stars to present different segments. While comedians like Hart aren't without their detractors, you'd be hard-pressed to find anyone who genuinely doesn't like The Rock. Stemming from his incredibly successful career as a pro wrestler, the legendary entertainer became even more famous after entering a movie career under his real name, Dwayne Johnson. As one of the most popular and highest-paid actors of all time, Johnson can frequently be seen in major motion pictures to hit the big screen, and his packed schedule keeps him constantly busy. While it's understandable that the entertainer would be too busy to take on the job, it's a shame as Johnson would most likely knock it out of the park. The movie Johnson was shooting will serve as a direct follow-up to 2017's Jumanji: Welcome to the Jungle. Curiously, it's a movie that co-stars Hart as well. Jack Black and Karen Gillian are also confirmed to appear to reprise their roles, with Danny DeVito, Awkwafina, and Danny Glover joining the cast. The movie's teenage characters will also be returning, with the original actors on board. Jake Hasdan is directing, using a screenplay by Jeff Pinkner and Scott Rosenberg. The movie is scheduled to released on Dec. 13, 2019. As for the Oscars, you can catch the event when it airs live on Sunday, Feb. 24, at 8 p.m. EST. We will have to see if the host-less show is able to turn the tide of the falling ratings the program has seen in recent years. 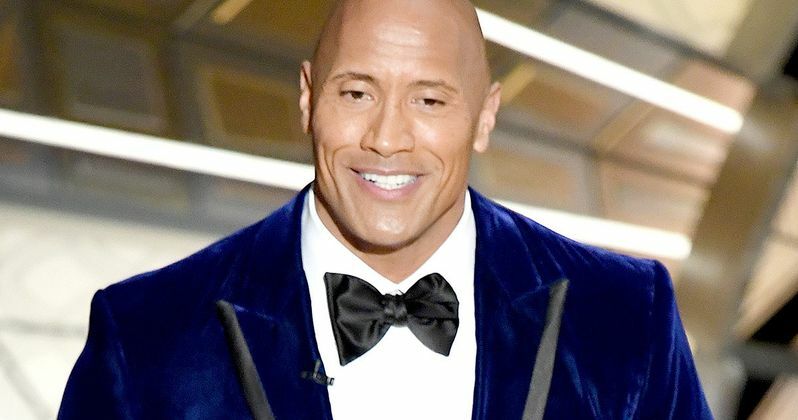 It seems that The Rock hosting would have helped the ceremony tremendously, but as the man says himself, there's always the possibility of doing it some day in the future. You can take a look at Johnson's tweet about turning the hosting gig below.